This Mushroom Sticky Rice post was originally posted on Facebook. I've had several requests to post it here to make it easier to find and so friends can refer it to other friends. If you love mushrooms like I do, you'll love this mushroom rice. It's a spin on the Takemoto family's famous mushroom fried rice--made with mochi gome/sticky rice instead of short grain rice. The mochigome gives it a wonderful chewiness, and the combination of different mushrooms and seasonings give this dish a wonderful umami--deliciousness. I recently found some brown mochigome/sweet rice at Nijiya Market. That would make it healthy, wouldn't it? Here's the Mushroom Sticky Rice when it's done. The grains of rice have a translucent quality to them. Marukai has a good selection of mushrooms, as does Nijiya and 99 Ranch Market. Shiitake, shimeji, bunapi, oyster, enoki & crimini (not pictured), etc., use whatever variety you can find and that you like. Simply one kind will do just fine, too. You can go to Costco and get the big package of mushrooms, or you can use the big tub of dried mushrooms they have in the produce section (thanks to The Booklady for that suggestion!). Simply soak the dried mushrooms in water until they're soft. The first thing you do is wash 4 cups of mochigome--sweet rice. Koda Farms Sho-Chiku-Bai is one brand that's easy to find at any Asian market. 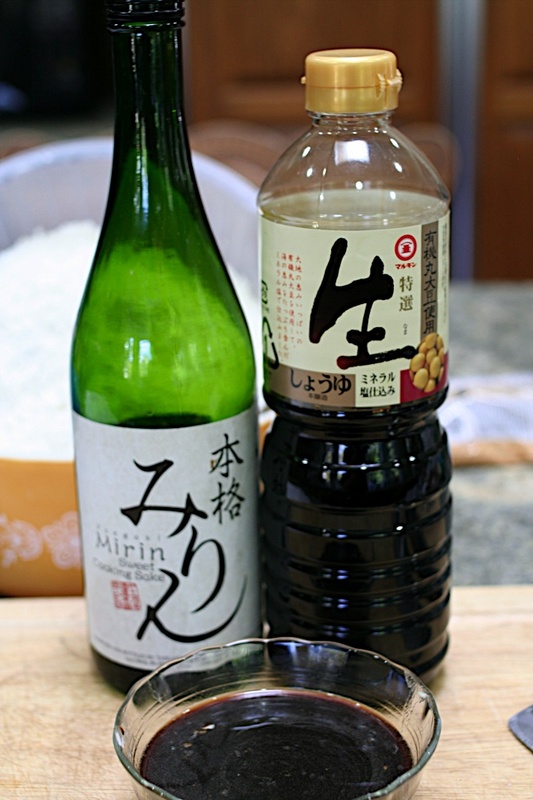 After the rice is rinsed and drained, soak the mochigome in enough water to cover, overnight or for six hours. Slice or separate all the mushrooms. It's about 8 cups of mushrooms. 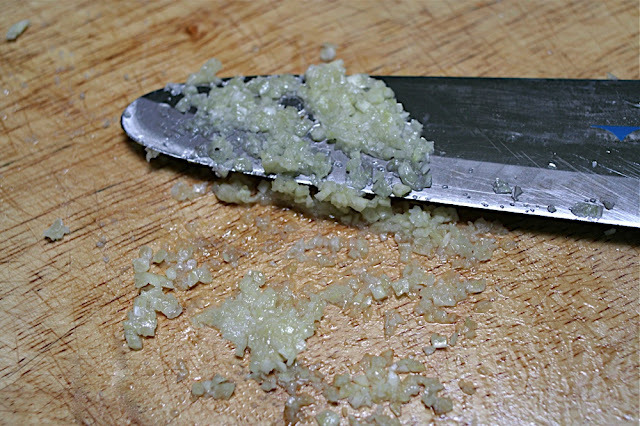 Chop the garlic and add a little bit of kosher salt when you mash the garlic with the flat of your knife. Mashing the garlic turns it almost into a paste. Heat the garlic butter in a wok or pot, and when it's sizzling, add the mushrooms. Saute until the mushrooms are wilted. The mushrooms will shrink a lot! Add 1 tablespoon shoyu (soy sauce), 2 tablespoons mirin (sweet cooking wine), 2 teaspoons (or one dashi packet) konbu dashi powder, and 1 tablespoon Worcestershire sauce (several companies make an anchovy-free Worcestershire sauce for vegetarians). And add to the mushroom mixture. Cook over medium-low heat until all the liquid has been absorbed into the rice, stirring constantly so it doesn't stick to the pan. When the liquid has been absorbed, turn heat off. Line the bottom with a paper towel that has been moistened with water and cut to fit--so the rice doesn't fall through. You'll remove the paper later when you turn out the finished rice. Divide the rice mixture into the two layers of the bamboo steamer. 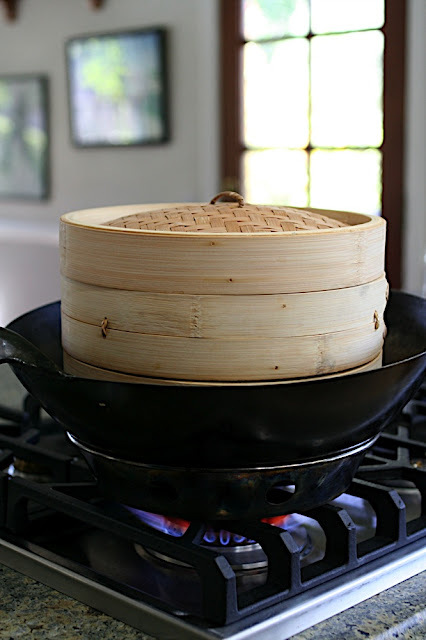 Bring enough water to a boil in the wok to give you a lot of steam, but not too much so that it touches the rice in the steamer. Place the steamer over the boiling water and steam for about 25 minutes. You want a good amount of steam, be sure to watch the water level and add more as needed. Check the two layers after 25 minutes and steam longer if necessary. (Turn off the heat & use potholders to check the bottom layer so you don't burn yourself from the steam.) If you don't have the steam strong enough, it will take longer. The grains of mochigome should have a translucent look. So yummy!! Reminds me of my Mom's cooking.